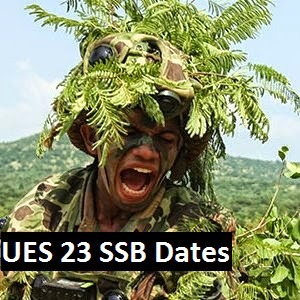 Have you applied for UES 23 course and looking for SSB interview dates of UES course? Indian Army has published interview details today officially. Check out UES 23 SSB dates of Bhopal selection board. Indian Army has invited applications from young men of India for University Entry Scheme 23 course in July 2013. Only students studying in pre final year were eligible to apply for the course. UES 23 course of Indian Army will commence in July 2014. Candidates who are in pre final year or sixth semester of engineering applied for the course. Army has completed verifying the applications received and has shortlisted candidates based on the marks scored. Today, Indian Army has officially uploaded the SSB interview dates of UES 23 course for Bhopal selection board. All candidates need to report at Bhopal Railway station at 1400 hrs. First batch of SSB interview is scheduled on 08 November 2013. Leftover students can appear on 30 December 2013. Candidates have to carry their documents listed in the SSB call letter to the selection board on the prescribed SSB interview date. Total 2007 candidates will be interviewed by Bhopal SSB selection board.